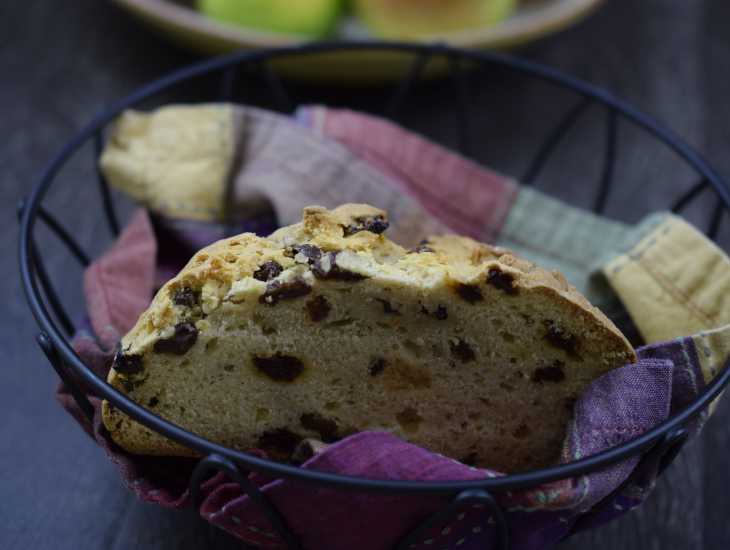 Rose's Irish Soda Bread was our recipe for October and it was a lovely adaptation of the well-known classic! Patty made her bread into delicious looking rolls. 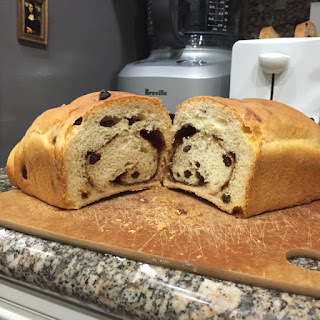 Packed with well-soused raisins left over from a previous recipe, she let them swim in a pool of bourbon until they were good and passed out. Sounds good to me! Laura had some trepidation about trying soda bread but she decided to trust Rose. It was well worth it and she is a devoted convert to Rose's adaption. Jeniffer recently lost her father and found baking to be at least a temporary solace, even if the lovely memories of food and family get a few tears in the batter. Rose's Bread Bakers are always ready to share some tea and a slice of toast if you need it, Jeniffer! This month's bread is timely since her step-son is in Ireland. She shared that across the pond, it's simply known as brown bread. Neat! Ellia was glad to get back into baking this month after her father's passing as well. This was a nice, easy way to get up in the bready saddle again. She and her daughters could hardly wait for their loaf to cool before gobbling it up. A dangerous and delicious treat! 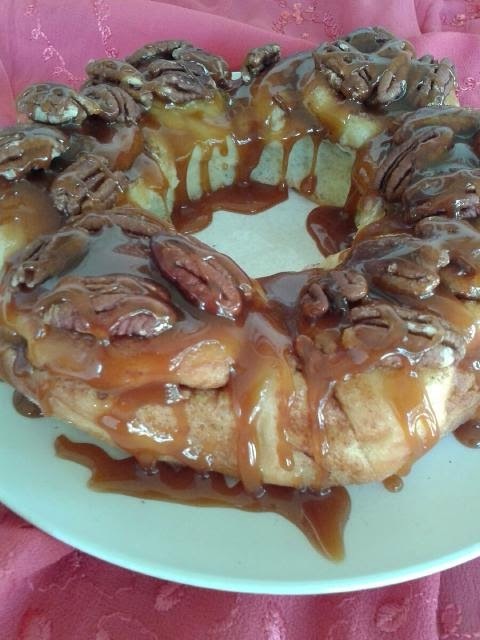 Vicki found this recipe incredibly easy to make, and incredibly scrumptious. 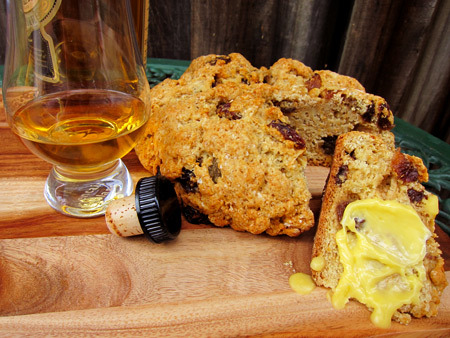 Her raisins soaked in a bath of whisky, with extra for the whipped whisky butter. Fabulous right out of the oven, she says this will definitely be something to celebrate St Patrick's Day. Joyce said this recipe is a keeper. She was definitely a fan of the whisky butter spread on a warm piece of bread as a lovely treat on its own. 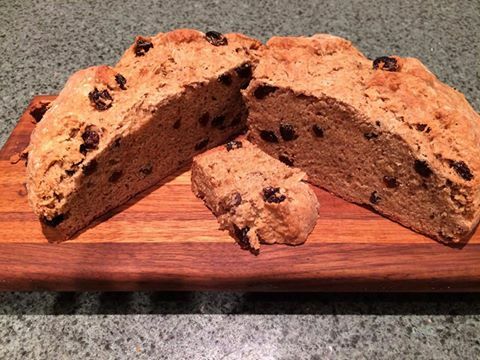 Sheryl treated us to a bit of background on the surprisingly devoted following of soda breads! While Rose's version might not be traditional, she still found it delicious and would make this one again anytime. First off, a very heartfelt thank you to all the Bread Bakers, for their patience and understanding as we grieved for the death of my dad and Vicki's husband. I will get the Round Ups back on track. Also, the blog site's photo upload is down so as soon as it's working again I will update with some beautiful photos of our bread. September saw us making Rose's basic hearth bread. But there is nothing basic about it! 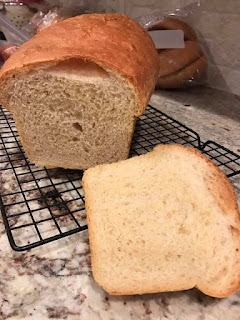 It is a simple, homey bread that is incredibly versatile and can be enhanced with savories or sweet depending on what you want the end result to be. This is the bread I think we all envision when embarking on a bread baking journey. Vicki found this bread to be relaxing to make - it was a recipe that helped evoke lovely childhood memories and help her conquer the mystery of bread dough. 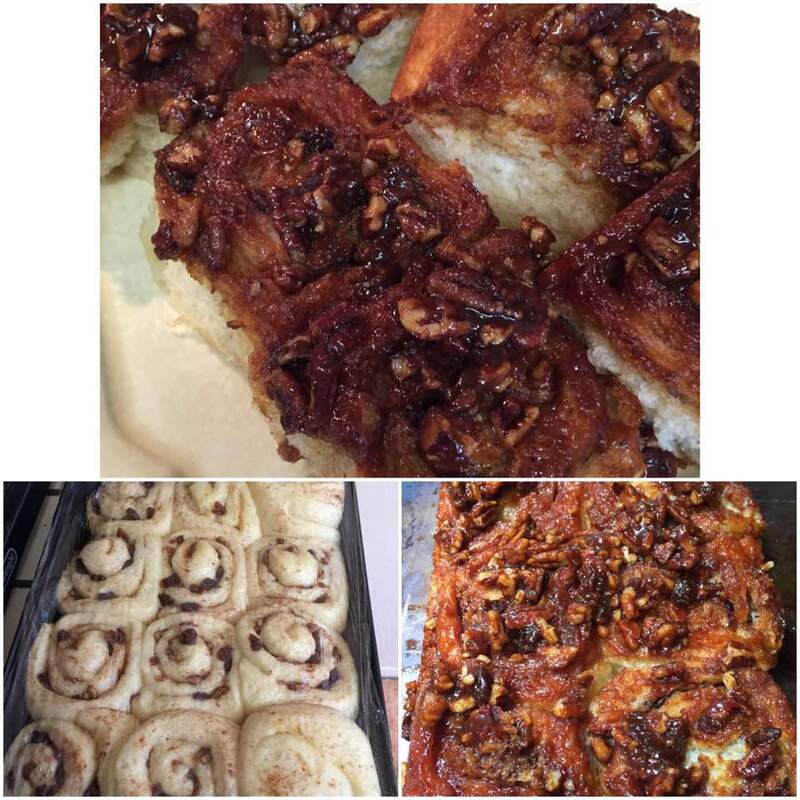 Jeniffer channeled some fabulous creativity in making her loaves. They look like something straight out of Gourmet Magazine. And, according to her, taste just as good. 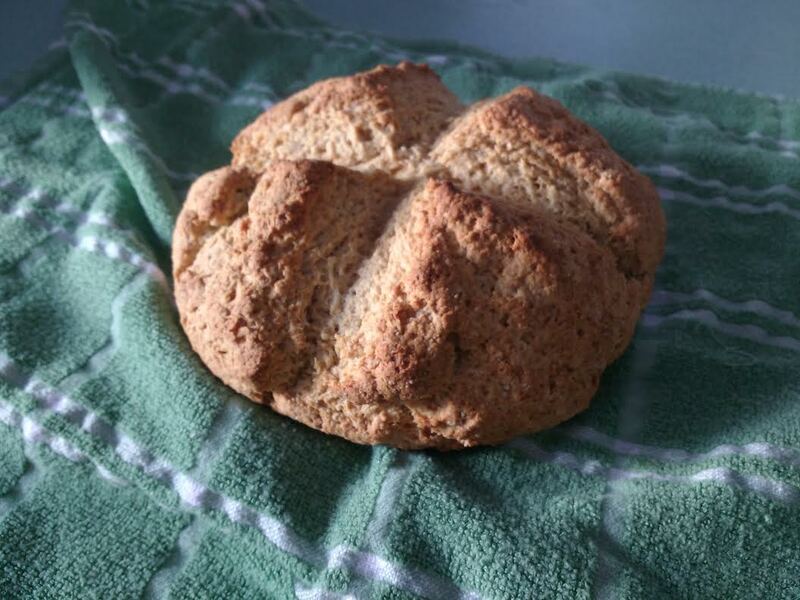 Laura made her loaf in free-form version and it looks heavenly to eat. She and her husband divvied up the spoils, smeared with lots of butter. Patty made two lovely loaves of the hearth bread, one a free-form and the other in a loaf pan. Both tasted wonderful and didn't have any problems even with a hundred degree California day. Joyce's bread came out spectacular, especially with the homemade garlic-and-chive butter used to make a delicious addition to some mushroom soup. Grab the recipe she gives for that butter! Sheryl demonstrated what a La Cloche clay bread baker can do for your bread - namely, making an amazing crust. She also includes an experiment with KA artisan flour and a recipe for skipjack tuna salad! Billie said she will never buy store-bought bread again. This recipe was too yummy and would be great with anything! There's something about August that seems to knock people for six! For a lot of the bakers in America, school has started back up already which means less time to dedicate to bread making *sad face* It's also a time for vacations and getting your last summer huzzahs. For our bakers in other parts of the world with different seasonality, it still seems to be a hectic month with busy calendars. In other words, I think we'll definitely be updating this Round Up in a few weeks after everyone gets on an even keel again. In the meantime, we had some intrepid bakers who soldiered through and delivered some amazing, delectable loaves of cinnamon raisin bread! First up is Joyce. She's our newest member to the Bread group and woah, can this gal bake! 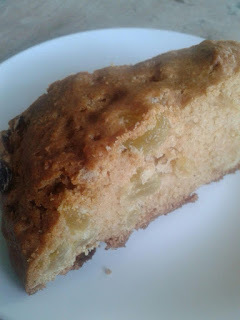 Her raisin loaf (she omitted the cinnamon) is spectacular, with an envious crumb and delicate texture. She topped her slices off with homemade Orange and Cardamom jelly. Our mouths are watering just looking at it! (Be sure to check out her results for blueberry muffins and the caramel sticky buns in previous Round Ups). 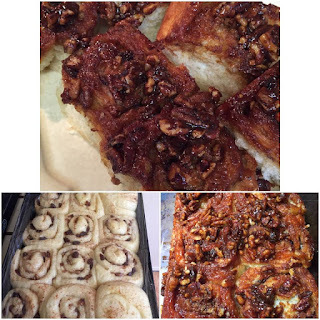 Sheryl is another of our blogger bakers and she has continued expounding on her bread baking skills. 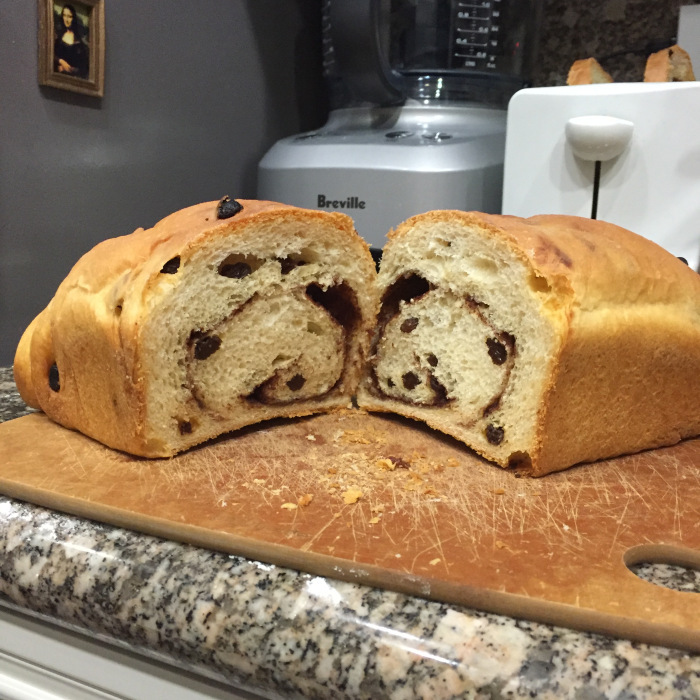 Despite a few hiccups, she produced two lovely looking loaves of cinnamon raisin bread. She's also starting to see some parallels between our baking pace and the movie Julie and Julia. Amen to that! Laura decided to take a field trip to her local farmer's market for some fresh Diamond Muscat raisins for her bread. And learned a lesson about using fresh raisins in bread (spoiler: they will pop out when slicing is all. Still tastes great). This bread was easy to overdose on - one slice just isn't enough! 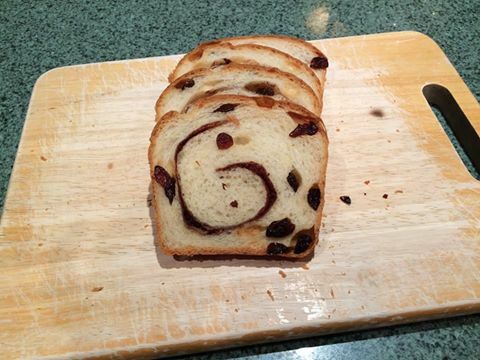 Jeniffer used a delicious mix of sultanas and currants for her cinnamon raisin bread - an excellent choice! She topped hers with fresh cheese and berries but thought this bread was yummy enough to be eaten unadorned. That's it so far for this month - check back later as the bakers post their results! If you want to experience decadence, this recipe is definitely one to try! This month, the bakers tackled Rose's first edition recipe of Caramel Pecan Sticky Buns. The Alpha Bakers may also recognize this updated version in Rose's fabulous new book, The Baking Bible. This recipe is great for expanding your baking horizons. Homemade caramel, lovely brioche dough, and experimenting with rolling and cutting with dental floss - the caramel buns have it all! 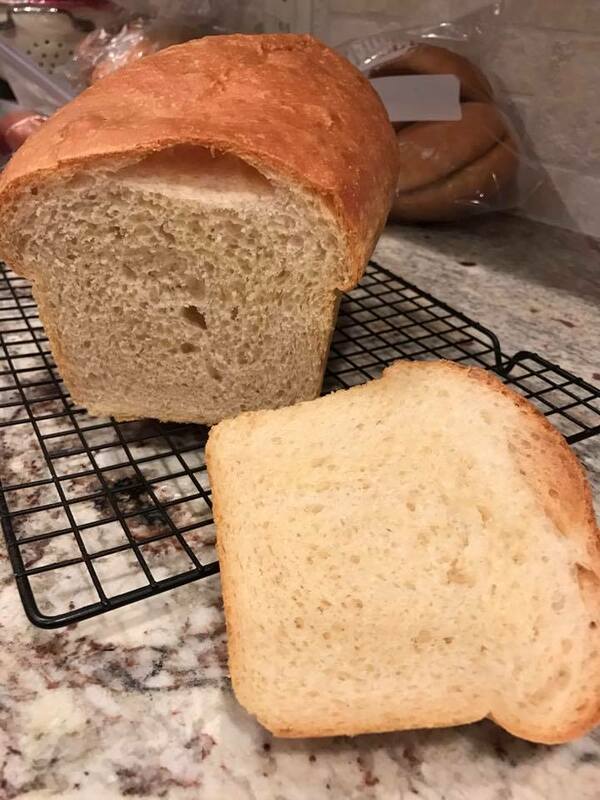 Vicki tried this recipe out with the Alpha Bakers last year, so she took a well-earned pass at trying Rolls version 1.0 but she remembered how much the family loved these rolls. Never again will she buy Pillsbury at the store! She set off the caramel by sprinkling on some sea salt and soaking the raisins in kahlua. Yum. Jeniffer was also charmed by these delicious rolls. 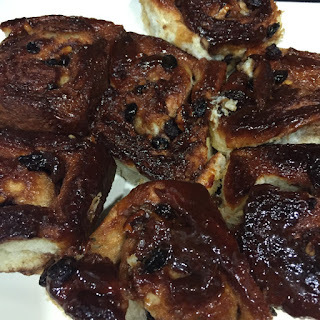 She was reminded of a cross between a chelsea bun and golden syrup dumplings. Jeniffer definitely recommends searching out muscovado sugar, if you can find it. Buttery, sweet, and delicate, these were a winner! Catherine was a champ with this recipe, experimenting with dark brown sugar for the caramel instead of muscovado. She made two batches, the second one having enough time to really soak up the delicious caramel which really kicked it to the next level of yumminess. She also notes that the brioche is amazing to watch rise and mature through its phases. I think all bread bakers share this enjoyment-fascination! Billie was very pleased with her rolls. 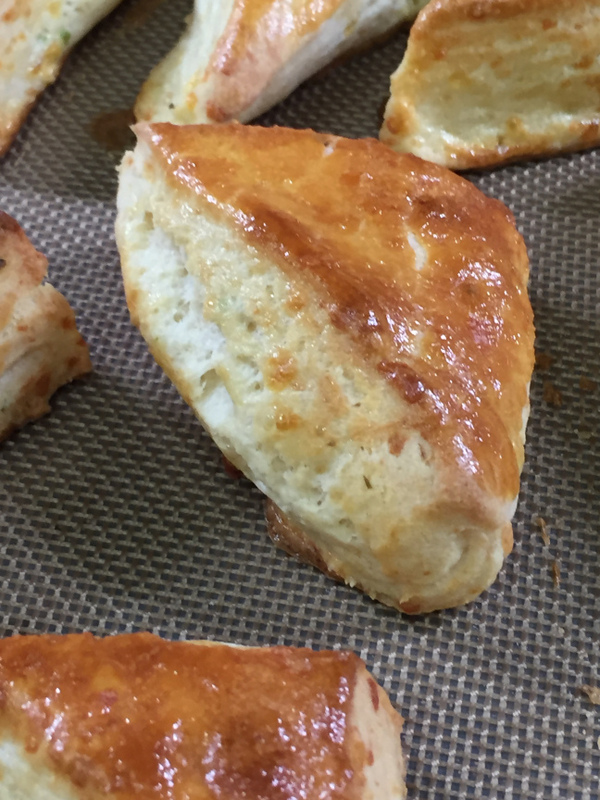 She used some leftover rosemary caramel for this recipe and thought the subtle flavor melded beautifully with the buttery, sweet dough. Delicious and light, the caramel buns got a definite thumbs up. Ginny's rolls also got a blue ribbon. Her kitchen smelled heavenly when these beauties were baking! Jennifer gave these a shot and thought the recipe was a challenge. We think they turned out great! 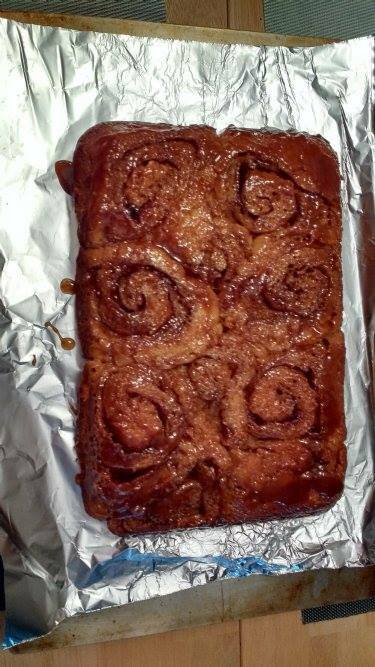 A real trooper, she stuck with the sticky buns until the end and served them to her family. Laura was happy to spread her wings and try this new recipe. She wasn't disappointed and thought it was quite fun to use dental floss to slice the dough up. Laura also called out what a lot of us did as well - clean up the caramel leftovers with a spoon and taste away! Sheryl loved working with the brioche dough (it is an amazing recipe) and decided to try the maple/walnut variation. 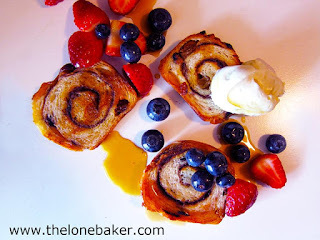 She found the maple/golden syrup combination absolutely divine and will definitely make these again - using her new OXO pan! 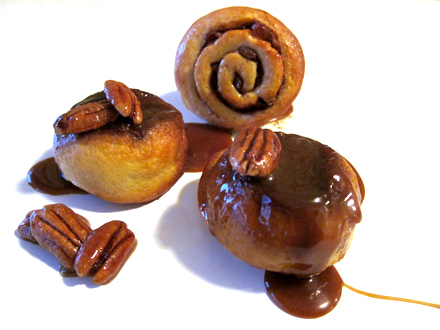 Elle had a great time learning how to make both a rolled up bun and homemade caramel. The caramel was such a hit that her teenage daughter/daughter's best friend immediately punted her out of the kitchen to make their own batch! 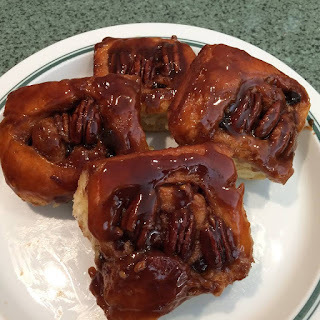 Elle chose to take the majority of these dangerously good buns to her husband's workplace to share the calories, where they were promptly devoured. 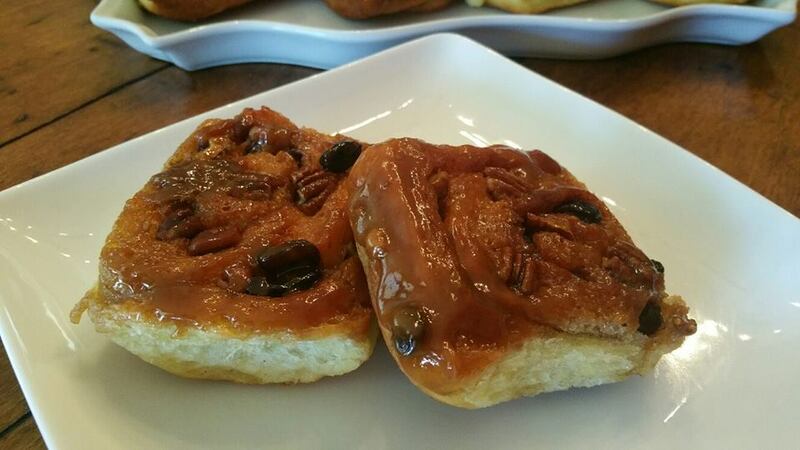 Joyce is our newest member and is jumping in with caramel sticky buns. Her brioche dough looked lovely and turned into a fantastic batch of sticky buns. 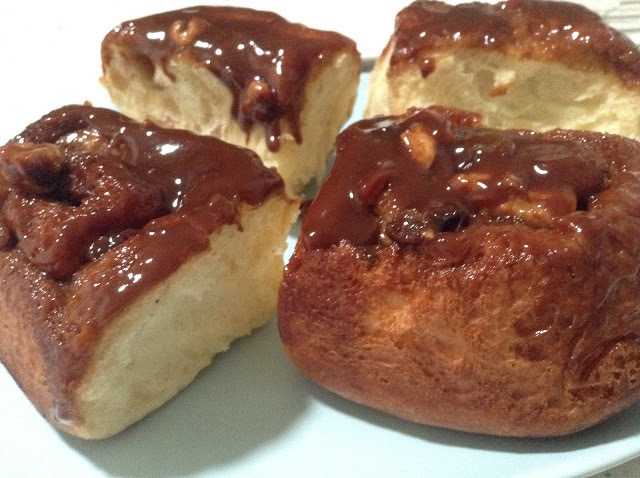 The aroma filled her kitchen with an all-too-tempting aroma and the sticky goodness of the caramel buns were not to be missed! That's it for this month's round up - happy baking everyone! 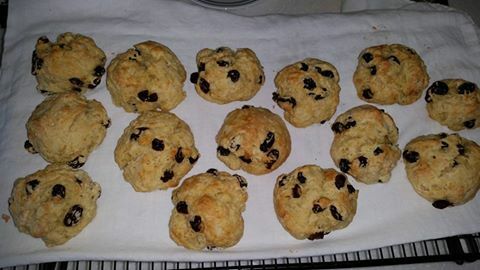 Still riding high of the success of our blueberry muffins, this month the group tackled Rose's flaky scones. 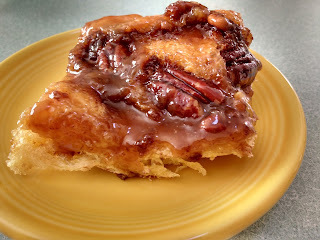 What a treat these are - buttery, flaky, sinfully decadent, and elegantly simple! 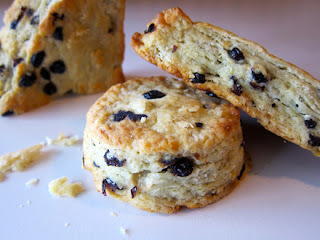 The most rewarding and exciting part of seeing the results this month is that everyone's scones are so fabulously unique - from lemon poppy seed to lime blueberry, currant to cranberry, savory, and simply plain.. We all put our own spin on these lovely treats with great success! 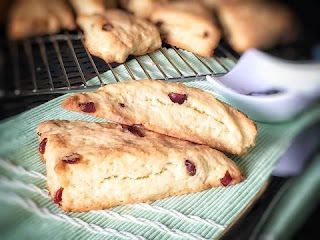 Lee Phing decided to use colorful cranberries for her go at these scones. She was on the hunt for a satisfying, wholly-delicious scone for afternoon tea that wouldn't end up sticking to the roof of her mouth or be too doughy. Did she find the perfect scone? Sounds like it! They turned out beautifully, with a delicate crumb and charmingly rustic shapes. Elle is a long-time lover of scones so she couldn't wait to try them, and hoped fervently that she would have success at making her own. She decided to omit the currants because offspring #1 doesn't care for the texture of currants/raisins/cranberries, etc in her baked goods. These were a win with her and her daughter and they enjoyed them with breakfast tea. Jeniffer was game to try the recipe even though this style of scone was not to her usual taste. It was a treat to see her break out her vintage round-cutter and make both circular and triangular shapes. 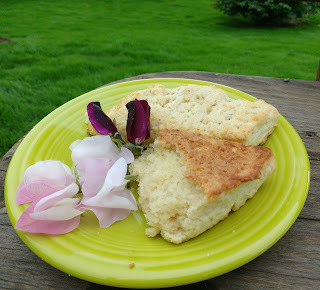 Her expertise in baking shone through as you could see the lovely, flaky layers in the finished scone. Jennifer decided to try the lemon poppyseed variation of these scones. This was also her first time making these, and thought they turned out great. They look wonderfully golden brown and ready to be smothered in jam and cream. Nancy was extra creative and made her own flavor variation - lime and blueberry! She also utilized the smart trick of grating the butter to keep it chilled, and chilling her baking tools to further limit the ambient heat that comes from handling. 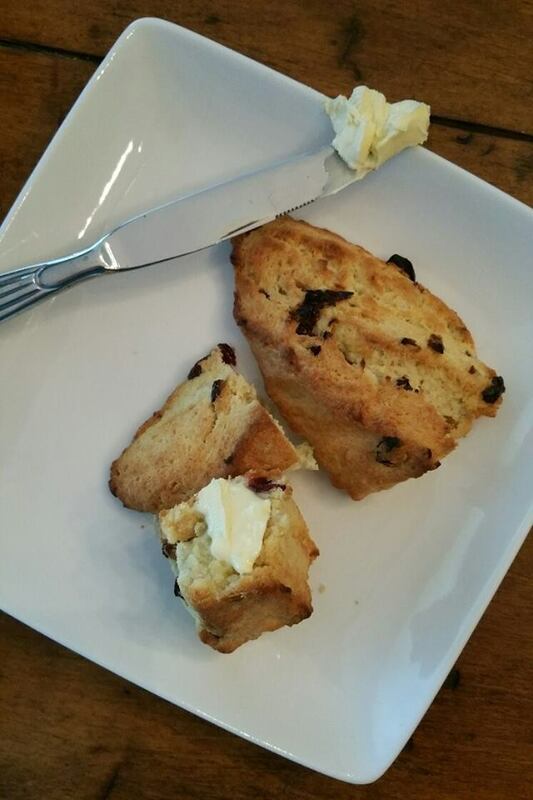 With scones, the colder the butter, the better the result! She also calculated out the WW points, which made us all gulp. But worth the calories! (I'm reminded of Han Solo's quote from Star Wars before attempting a dangerous ship maneuver, "Never tell me the odds!") In baking, never tell us the calories. Our ignorance (if not our waistlines) is bliss. Ginny decided to throw together a medley of dried fruits, which sounds spectacular. Although she thought they overcooked a tad and got a little more brown than golden, they still look heavenly, especially smeared with a pat of creamy butter. Like the rest of us, she decided to share the wealth and give some to friends, neighbors, and acquaintances to keep from devouring them all. Billie is new this month, joining up with Ginny. We are happy to have new bakers joining the group this month! She chopped up dates for these scones - very yummy! She too shared the wealth, knowing how dangerous and delicious these are. She also points out that these are great frozen, to be enjoyed later on. Vicki felt a little trepidation at making scone dough, but she needn't have feared. 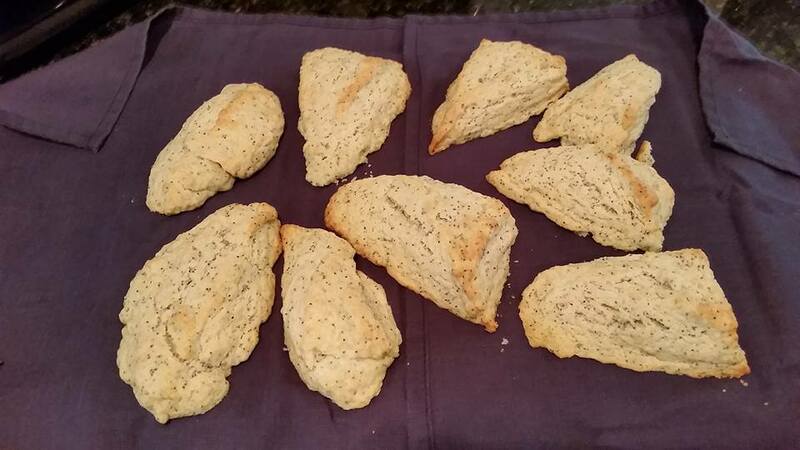 Even having to add in a bit of extra cream to combat dryness, these scones turned out beautiful! They look so inviting with her special lemon curd and some cream. The golden tops and colorful currants give it just the right touch. And they tasted amazing! Sheryl was truly the most creative of the group. 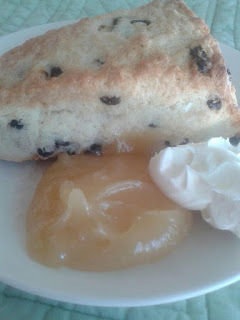 Not really a fan of scones to begin with (but still up for trying out the recipe, with a new food processor too!) she decided to go the savory route and substituted ingredients like chives and mexican cheeses blend. Buttery goodness, chives, and cheese - how could these not be a winner? These were tasty enough that Sheryl could definitely see herself making these again. Looks like that food processor worked great! 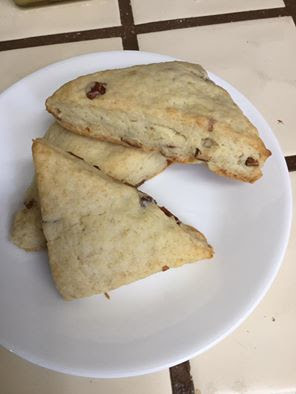 We still have some of our group that is slated to make these scones - we'll update the Round Up with their fabulous creations when completed. Here comes July - with Rose's Caramel Sticky Buns! What a fantastic inaugural month for Rose’s Bread Bakers! We’ve had such an outstanding response from the baking community and welcomed over twenty members to the group – this is so exciting and we all can’t wait to share our baking journeys with one another. For this first month, we did something simple (and simply delicious! 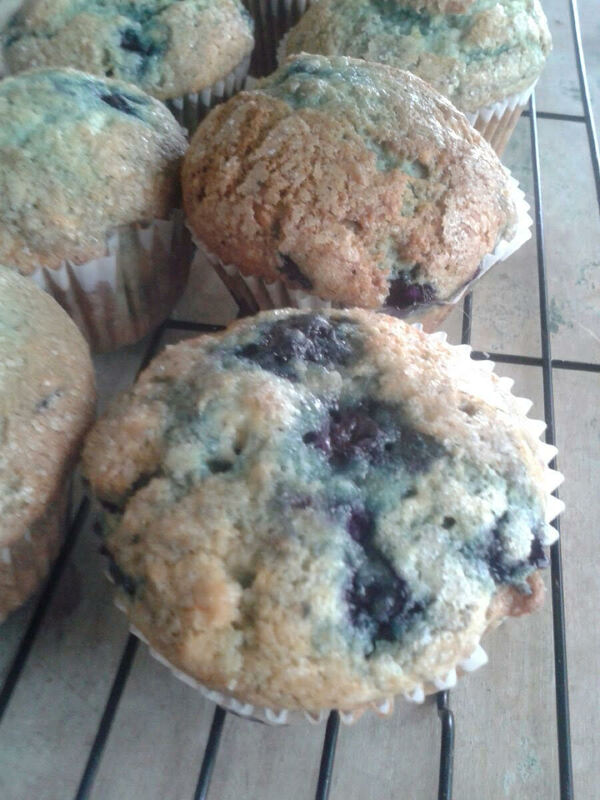 ): Rose’s Blueberry muffins. With a secret tang of lemon, a juicy burst of blueberry, and a hint of nutmeg, this recipe met with rave reviews from all of our bakers. Catherine stepped out of the blueberry box and substituted raspberries. A swap that she says turned out wonderfully when combined with the almost-cake like texture of the muffin and the tarty tang of raspberry. She recommends doubling the recipe because six muffins just aren’t enough! Jeniffer said “Going, going, gone!” to these lovely treats and shared with us that it was her first time eating blueberry muffins. She appreciated the subtle undertone of nutmeg giving it a mysterious depth of flavor. I can’t think of a better recipe to try out for a first time! She recommends re-heating the muffins before eating the next day. Vicki not only treated us with her glowing review of the recipe (she too loved the citrus and nutmeg undertones of the muffin and gave a great tip of keeping a light hand in mixing the batter), but also shared her first memory of her own mother coming home with a store-bought muffin mix that even had a tiny tin of blueberries. How times have changed! Laura made two batches of muffins. The first contained self-rising flour as a clever substitute for baking soda. The second batch was stellar and incredibly tender. She used her Danish whisk on this batter and I think the results were spot-on! 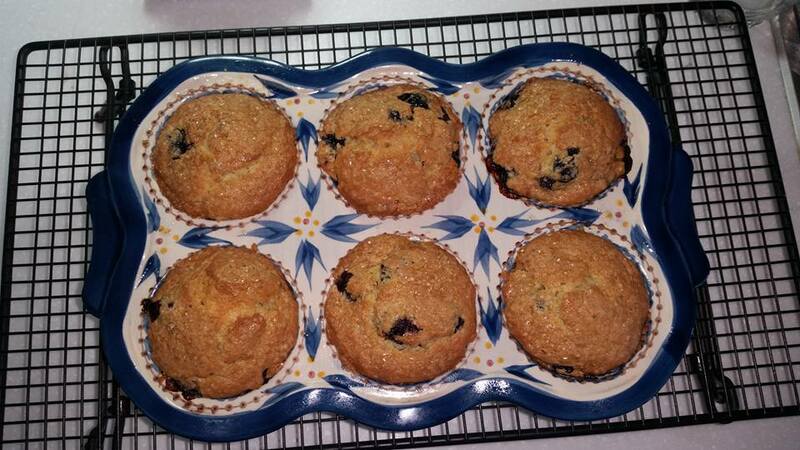 Jennifer did some creative refiguring because her berries were on the larger side and the muffin tin on the smaller end. 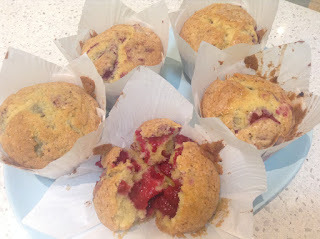 Nevertheless, her muffins look fabulous and tasted great even with the changed berry-to-batter ratio. She also asked a question that I believe all of us wonder – does everyone’s kitchen look like a hurricane after baking? The answer is yes! 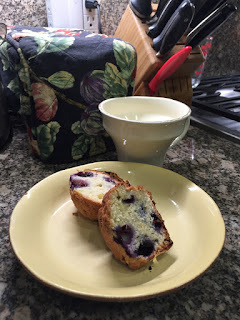 Kimberly greatly enjoyed baking the muffins and especially having one the next morning. She thought it was an easy recipe and you can’t argue with the results. Well done, Kimberly! Nancy, a true baking veteran, winged some substitutions into her recipe with fantastic results. She, like several other bakers, also used frozen berries (her own bush wasn’t ripe yet) and the slight mottling of the juices created a lovely contrast to the finished muffins. That’s the joy of a good, simple recipe – adaptation! 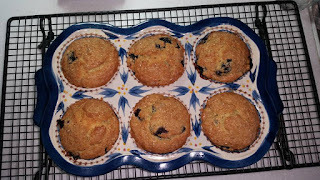 Patty used a darling muffin pan to bake with this month, and even better, had meyer lemons from her own tree! I can only imagine how yummy that must taste. She too thought the recipe was easy to follow with awesome results. She also tried them with strawberries (tasty!) and may try again with a sub of basil for lemon. Can’t wait to hear how those taste! 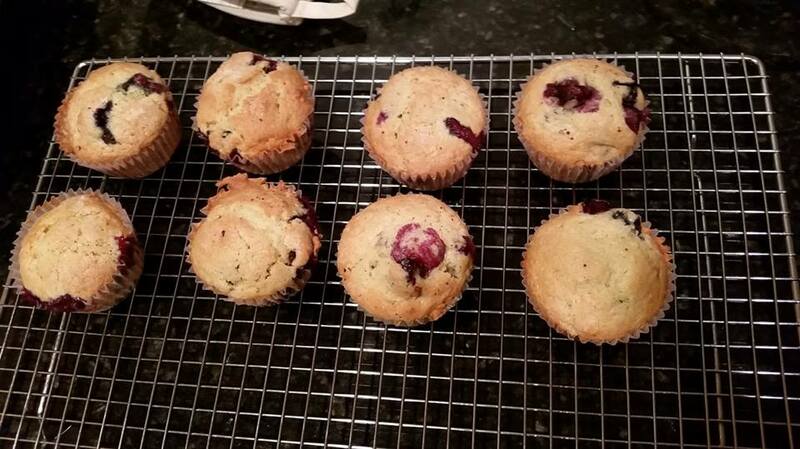 Kym shared her creations, made without lemon, and commented that the nutmeg gave the muffins a very special taste. They certainly looked yummy! 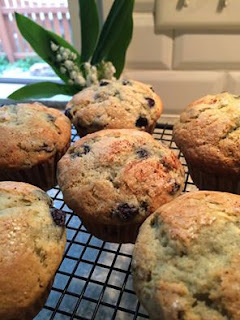 She’s made these muffins multiple times, a true make-again recipe. Lee Phing was one of our first bakers to join and we are so glad she did! Adventurous soul that she is, she made these muffins for mother’s day to share with her mom to try and convince her that not all muffins are tasteless. The results are in and both mother and daughter thought them delectable! She tried this recipe out twice for good practice (and more delicious muffins to eat) especially because living in Malaysia sometimes sourcing ingredients is challenging. 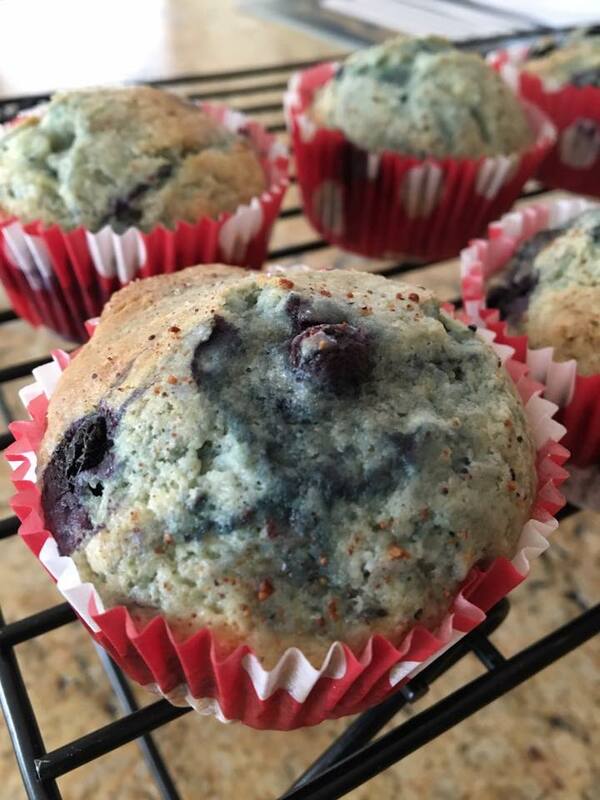 Elle loves blueberry muffins and this recipe will be her go-to recipe from now on. She thought the lemon was a perfect addition, a subtle counterpoint that really set off the juicy berries. Joyce is a very avid baker and like all of us, a long time lover of Rose's cookbooks. 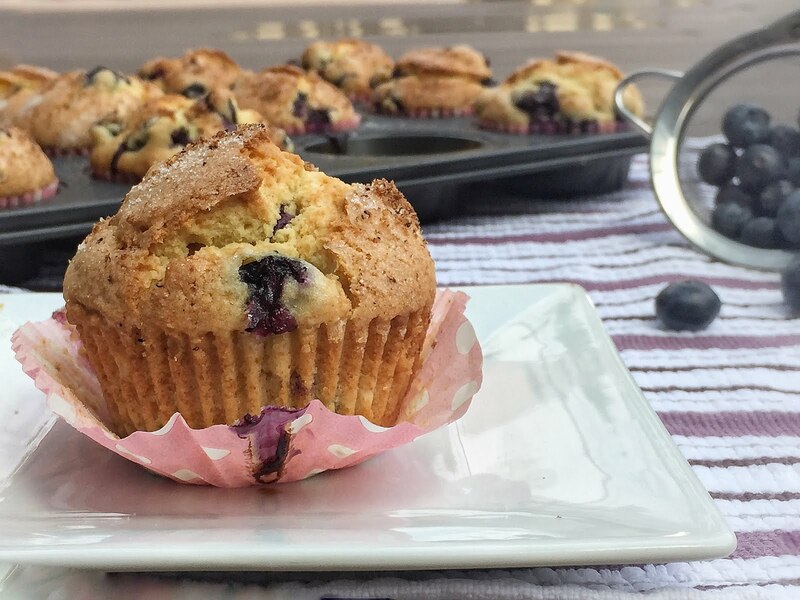 Her blueberry muffins look delicious and we completely agree that they are perfect for tea time! Sheryl joined us in making blueberry scones, and boy did they turn out amazing! She met with great success at this scratch-baking venture and commented that they are both easy to make and far superior to any store-bought mix. We all heartily agree! This site is dedicated to the legendary baking book from Rose Levy Beranbaum, The Bread Bible. The book has been out for several years but it's an amazing collection of easy to follow recipes that always taste delicious! If you are new to working with yeast or a seasoned bread baker, you are in the right place. The only thing we request is a love of baking, experimenting, and consuming tasty discoveries. We will be doing a recipe once a month, and you'll have that entire month to bake the month's recipe and post. The first week of the following month, we'll post a roundup (or recap) of everyone's experiences. If you post later than that, don't worry! We can always update the roundup. If you only feel like baking certain breads, that's okay too! So, for every month, we will post on our blogs (or facebook group) how things went for each recipe along with pictures. Please don't post the recipes on your websites or facebook pages out of respect for Rose. Something extra special is that Rose has made some updates to certain recipes throughout the book. It can be found in the side bar. If you would like to have your own copy of this fantastic book, get The Bread Bible here at Amazon. One of Rose's Alpha Bakers, Marie, has already baked her way through this book! Her blog is a great resource if you need some extra advice or to see the process. We also have a community facebook page to chat and encourage each other! Please comment below if you're interested in baking along with us through this fabulous collection of recipes.